Here at Quikpoint, we have unbeatable prices on batteries. 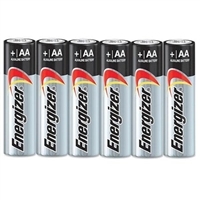 We are offering 6 AA brand new Duracell Coppertop batteries (bulk packed) at a great price! Our Dragon Puffer Air Flow Indicator, Dragon Puffer Air Flow Indicator Kit, Wizard Air Flow Indicator Kit, and Wizard Stick all operate on 6 AA Batteries.